Published Bestsellers: "WHAT A BEAUTIFUL STORY! It creates mixed emotions"
"WHAT A BEAUTIFUL STORY! 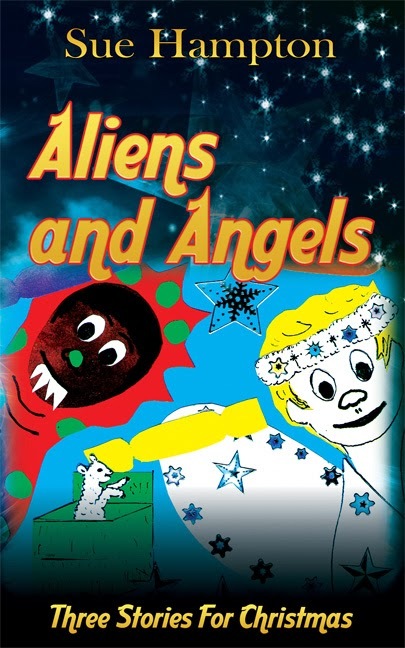 It creates mixed emotions"
readers or even as a gift for young keen readers on Christmas. It is coming out on the Thursday 26th September 2013. If you are looking for a special something for a child on Christmas, I suggest you go and buy this book in store. The colours and images of the book as seen in the image above are quite colourful and eye catching. It is for sale for £5.99. Visit www.suehamptonauthor.co.uk to find out more about this book. Great buy and I definitely recommend this book to anyone who has young children, grandchildren, nieces or nephews, cousins even brothers or sisters! I could easily read this book again." Sue Hampton captures the spirit of Christmas with three warm-hearted stories full of humour, mystery and magic – starring a boy who’d rather be an angel than a globalob, a donkey called Trouble and a girl with a cracker-sized lamb. With illustrations by children from schools Sue has visited, this is a book to make you smile at any time of year.